» The Struggle For Truth! 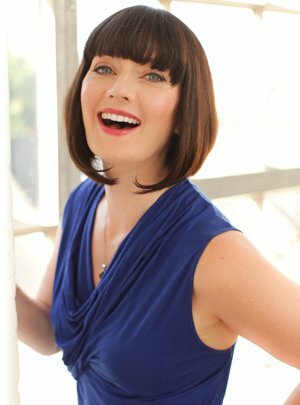 I was having a chat the other day with a fragrance expert about the need for honesty in the industry. We were discussing the fact that certain people portray themselves in a way that is not wholly accurate and use clever marketing to construct the smoke and mirrors to detract from their real roots. This is not a new phenomenon, in fact reading the book “The Secret of Chanel No. 5: The Biography of a Scent“, we learn that Coco Chanel often created elaborate stories to shield her upbringing even paying off members of her family to hide the fact she grew up in an orphanage! Often what happens is that an expert is approached by a journalist for a quote or an article. If you are lucky they will get your approval before sending the piece to press, but usually this is not the case. If your bio or background doesn’t quite fit the story the editor will often use a bit of creative license so that it does and chinese whispers are likely to enshew. Here is an example that happened to me recently. I have always had a passion for fragrance and an acute sense of smell. 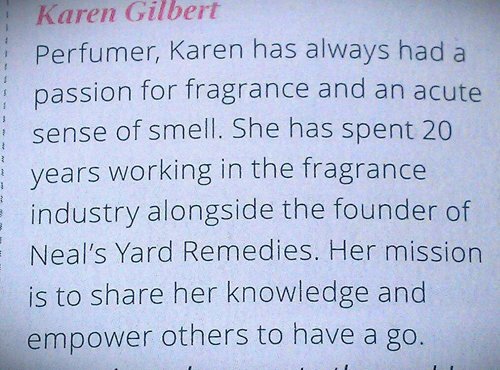 I have spent the last 20 years working in and around the fragrance industry with companies such as International Flavours & Fragrances as a fragrance evaluator and Neal’s Yard Remedies where I worked in both product development and training alongside the company founder. My mission is to share the knowledge I’ve gained over the years to empower others to do it themselves. I currently teach a range of perfumery classes in London as well as corporate events and private functions. As you can see some simple editing has changed my whole past career to something that is completely untrue. 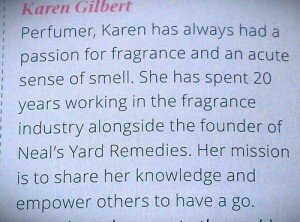 The article also referred to me as “Natural Perfumer Karen Gilbert” which is also not how I would describe myself at all. Journalists and editors please do us “experts” a favour and ask before you make something up.